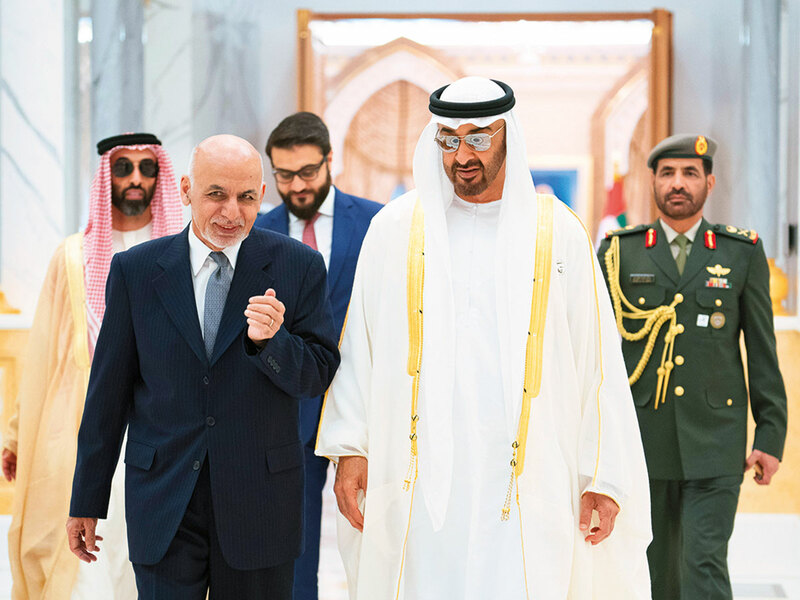 Abu Dhabi: His Highness Shaikh Mohammad Bin Zayed Al Nahyan, Crown Prince of Abu Dhabi and Deputy Supreme Commander of the UAE Armed Forces, and President Ashraf Gani of Afghanistan, on Sunday discussed ways to advance cooperation between the two nations. Shaikh Mohammad welcomed the visit of the Afghan President and his accompanying delegation to the UAE and hoped the visit would contribute towards enhancing ties between the two countries to achieve their mutual interest and aspirations for progress, development and prosperity. Shaikh Mohammad and President Gani reviewed areas of cooperation in trade and investment, development and humanitarian sectors, in addition to boosting efforts to support the reconstruction, development and peace initiatives in Afghanistan. The two sides also reviewed issues of mutual interest, as well as regional and international developments, particularly those concerning efforts to combat terrorism and extremism, and means to achieve security, stability and peace for the region and the world. Shaikh Mohammad said that the UAE, under the leadership of President His Highness Shaikh Khalifa Bin Zayed Al Nahyan, pays great attention to supporting regional and international efforts that aim to assist the Afghan people to overcome challenges and obtain peace and stability within their country. The UAE, he added, is keen to continue its humanitarian and development support in education, health and social sectors of Afghanistan, which are essential pillars for development and stability in the country. The two sides affirmed their countries’ efforts to develop bilateral relations in various fields of cooperation that serve their common interests and contribute to development and stability in the region. They also stressed the importance of redoubling the international community’s efforts to achieve peace and security and to consolidate the values of tolerance. Later, the two leaders witnessed the signing of a number of memoranda of understanding, MoUs, between the UAE and Afghanistan in education, culture, sport, mining, energy and agricultur ewith the aim to promote and develop joint cooperation between the two countries. Dr Anwar Mohammad Gargash, Minister of State for Foreign Affairs, and Mohammad Humayon Qayoumi, Afghanistan’s Acting Minister of Finance, signed four agreements on education, mining, energy and sports. Qayoumi also signed an MoU on cultural cooperation alongside Noura Bint Mohammad Al Kaabi, Minister of Culture and Knowledge Development, and an agreement on agricultural cooperation with Dr Thani Bin Ahmad Al Zeyoudi, Minister of Climate Change and Environment.